The CemToCD place the files automatically in the Distribution folder. This information is to provide users a method of adding additional files. See the CemToCD for additional information. Photos can be dragged and dropped using the CemEditor or by filling an entire folder as described below. The CemEditor and CemViewer are dependent on files being in the right locations for the database and viewers to work correctly. 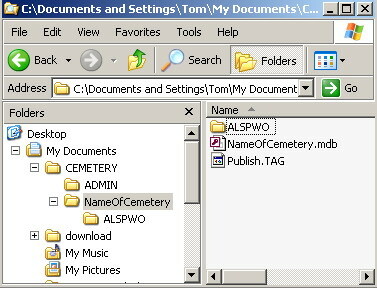 If you have a cemetery named "NameOfCemetery" that you are transcribing then you will want to make a folder and name it "NameOfCemetery". Your pictures are then copied to this folder either now or later, but before entering them. When the editor is open you simply type in the first picture name and it should open in the Editor Screen. Images can also be selected by double-clicking on any of the image fields. If you want to put pictures in sub-folders of the "ALSPWO: folder you can, but you will need to enter the sub-folder and picture name in the Cem-Viewer. The CemViewer looks for a .enc picture file. The CemEditor looks for the filename you type in. If you want picture sub folder of ALSPWO then enter the sub folder name and the picture name.